Lv abc cable is used for overhead power transmission and distribution lines of AC, and the rated voltage is up to and including 1KV. Low voltage aerial bundled cable of Huadong Cable Group can service at construction sites, as a secondary cable or street lighting. Low voltage aerial bundled cable plays a very important role in the abc cable market. The same the international market, lv abc cable is a kind of mainly export production of abc cable in Huadong Cable Group. This years, the exports of low voltage aerial bundled cable occupy over 99% of all abc cable. So in the aspects of producing and exports of lv abc cable, huadong has the absolute experiences and advantages. If you want to enjoy our comprehensive service and help, and get the high-quality low voltage aerial bundled cable, please leave your message, we will contact you within 24 hours. How to choose a good-quality low voltage cable? When we choose the lv abc cable, we need adhere to some rules. The rated voltage should be less or equal the voltage of supply power system. The allowed continuous current of low voltage aerial bundled cable should be equal or larger than the maximal continuous current of power load. If you want to choose the right lv abc cable, you should know your needed voltage and continuous current. Compared to your needs and the products, then choose the most proper low voltage aerial bundled cable. The core cross-section should satisfy the short-circuit stable demand of power supply system. Expect these aspects, you need calculate if the voltage drop satisfy the demand according to the length of lv abc cable. Compared to other producing way of most mechanical and electrical products, the low voltage aerial bundled cable is totally different. The lv abc cable is regard the length as the unit. 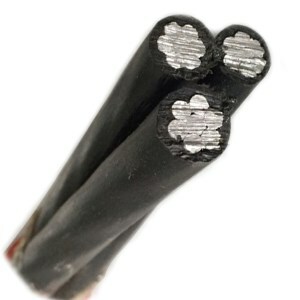 Low voltage aerial bundled cable is machined from the conductor, and then add the insulated layer. Leave your message,you can get the most satisfied lv abc cable.